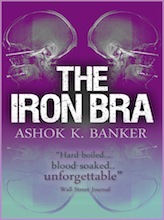 One of India's First English Crime Novels, The Iron Bra by Ashok Banker deals with Mumbai Underworld. Sheila Ray daughter of the infamous Ashok Ray - an undercover cop who was betrayed by both the sides leading him to leave the city in disgrace and shame. Unable to deal with the notoriety Ray tops himself leaving his daughter to fend for herself. Now that daughter is back to the city where it all started. She wants the truth on why her father was betrayed and by whom. She's also looking for vengeance against those who were responsible for her father's suicide. But in a city where relations and friendships change at the drop of hat and nothing is as it seems, Sheila is caught in the classic dilemma whom to trust and whom not to. Banker takes his readers into the gory underside of Mumbai that exists just below the surface, just below the glamour and jazz that the city is known for. The intimate coterie between cops and gangsters the only friend you have is a dead one. Set in the 1980's Mumbai teeming with corruption and bhaigiri; Banker's story has a lot of grammatical and spelling mistakes. But as he writes "In 1980's India speaking English well or badly was a political statement". The book also suffers from plenty of blood and gore or as Banker is wont to say "offals". The amount of abuse the heroine undergoes towards the end of the book makes her seem almost like Jesus reincarnated. While reading those sections I felt as it I was watching a bad remake of the passion of Christ. But to be fair to Banker he envisioned & published the book much, much before Mel Gibson released the movie. While the protagonist happens to be a gun toting Lara Croft wannabe women, at some place through the book it falls flat as Banker has tried too hard on the gory aspects of the book. Still it is a breezy way enough to get through and in Banker's patented style, fast paced to read. Verdict: Read it if you don't have anything better to do on a hot afternoon.